As we almost made the table, we need to figure out if everything, which we needed to do, is already done. One of the core points is "Are you tired? Do you enjoy what you are doing?" If you are still reading, possibly, you still want your table to be done. As far as you see the home roulette table brings both fun and irritation, as some of the parts are not easily made. If you bought, for example, a padded rail, you have one problem less. But still we are on our way to finish building the table. The particle board is made. Now it is time for the table to be complete. As we know, we should prepare a pair of the folding legs. You can buy them in any hardware store or other specialized shops. While installing, follow carefully all the instructions you receive with the legs. This step is one of the most important ones, as we are going to place the roulette wheel on the table. 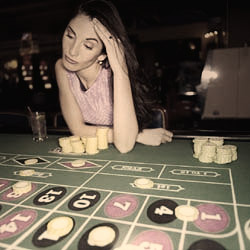 When we were on the Step 2, there was the point, when we needed to make our choice on the roulette wheel. We had two options: to get the wheel that will be attached to the table or to get one, which will require a hole in the table. Now it is time to place the roulette wheel on the table. And again, you need to follow the producer's instructions carefully, while placing the wheel. If it is that kind of wheel that sits in the hole, you simply take it and place there. Remember, you had a choice to cut the holes for the cup holders? So, now it is right time to put the cup holders into the holes and enjoy the game. The roulette table building and installing mission is complete. Well done. Try your new table with your family and friends! !